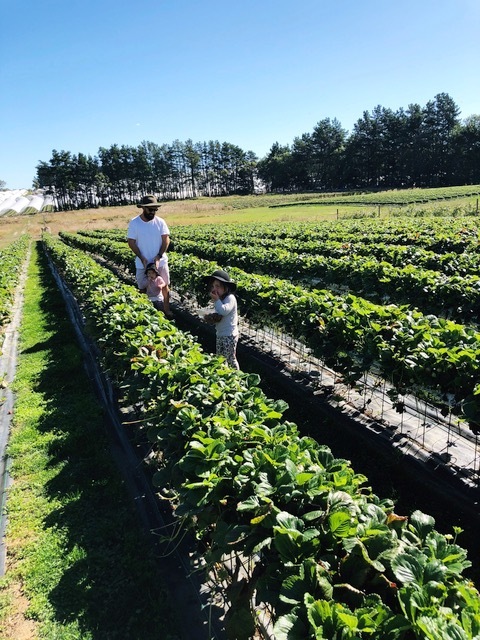 The Village Markets co-founder and mama of two, Sarah Schoeller, recently visited Tasmania with her husband Jared and daughters Lola Honey, 3, and Posie Plum, 1. 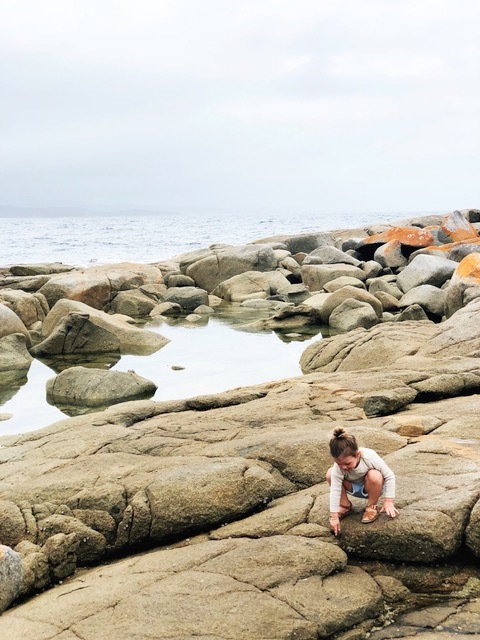 The family started their trip with a luxe stay at the Museum of Old and New Art [MONA] within the Moorilla winery on Hobart's Berriedale peninsula and then hit the road in a campervan exploring the natural, otherworldly beauty of Australia’s southernmost state. She shares her adventures and tips with The Travelling Tribe. 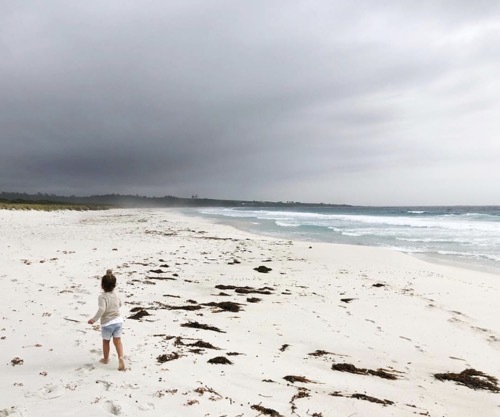 You had the opportunity to stay at MONA for a wedding with your family, what a treat! Tell us about this experience? We were very lucky to stay onsite for our best friend’s wedding. MONA (and the wedding) was mind-blowing! The gallery is beyond amazing and I would highly recommend a visit if you’re in Hobart. I was lucky enough to spend a few hours childfree when we returned to Hobart and loved every part of the gallery. Staying at MONA was a real treat. The pavilion was stunning and overlooked the Derwent River. We watched the sunset and boats pass by, enjoyed chasing the resident chickens and rabbits and jumping on the tramp [a sculpture at the front of the gallery]. Nothing is overlooked and the quirky touches in the accommodation and gallery are what make this place incredible. You can’t go past the on-site restaurants for extensive wine list and beautiful food. What were the challenges about staying at luxury accommodation with two busy girls under three? The staff were really accommodating and made it an easy stay, providing high chairs and room service lunch. Sharing one bedroom was a challenge, but the pavilions were spacious and there was plenty to see on site to keep us busy such as the pool, swings, sandpit, trampoline and chooks. How many nights did you spend here and what were the rooms like? We spent two nights in the Esmond Pavilion, designed by Fender Katsalidis, which was one bedroom and free standing, with a beautiful view of the river. The Pavilions are stunning and feature art and an extensive library. 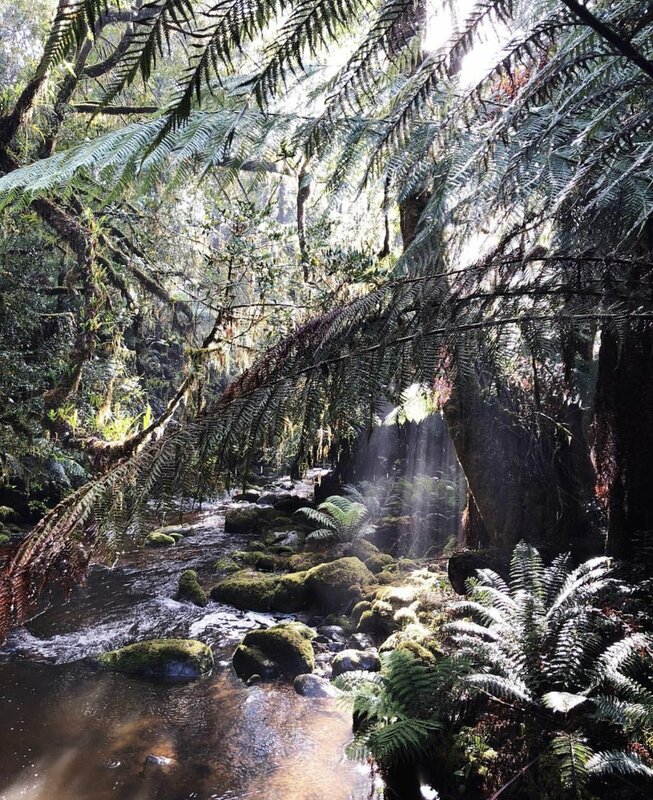 You travelled by camper van for the remainder of your stay in Tasmania. Who did you hire this through? 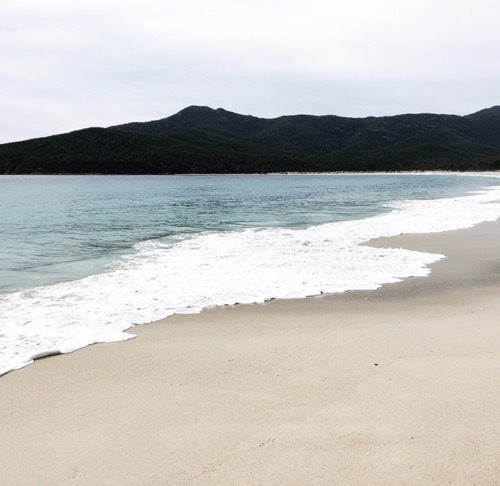 We did seven nights in a campervan travelling up the East Coast of Tasmania. We hired the van through motorhomerepublic.com.au and it included car seats and a table and chairs. What was the size of the van and did you all bunk in together? We went for the six berth thinking we’d each have a bed and we’d pop Posie in the portacot. But we ended sharing a bed with the girls each. Lola loved the magic cubbyhouse/top bed and was excited to jump in each night. How did you find the van with the girls, given it was the first time you’d travelled this way as a family? The van was better than we imagined. Having a bed, wardrobe and fridge with you 24/7 made travelling with kids so easy. We’d stop on the roadside for lunch [or naps] and found it super cosy. Did you eat out for all of your meals, or cook on-site? We cooked on site at BBQs or in the campervan for most meals besides having fish and chips and a bakery stop. What did you do to keep the girls happy on the drives? We kept our drives under two hours and made sure the girls had plenty of time to run around before heading off so they weren’t bursting with energy when driving. We packed pencils, paper, building blocks and Yumboxes before each trip to keep them busy. Which campgrounds/national parks did you stay at? Where were some of the best spots you found to eat/drink? The Hub for pizza in Derby. Lola’s for coffee and wholefood bowls in Hobart. Pigeon Whole Bakers for bagels in Hobart. The Gulch for the freshest fish and chips in Bicheno. The Source for the most amazing breakfast and the Wine Bar for antipasto at MONA, Berriedale.